Mr. David Miscavige, ecclesiastical leader of the Scientology religion, officially opened the doors to the new Church in the Bay Area. Mr. Miscavige dedicated the restored landmark Transamerica Building, in the heart of downtown San Francisco, to a new era of spiritual activity. 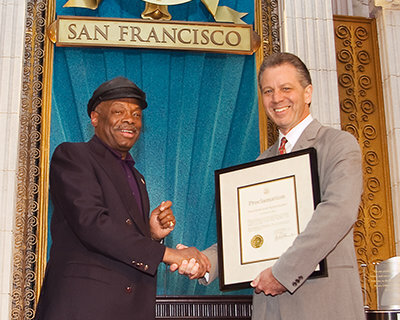 On November 29, 2003, Mr. David Miscavige, Chairman of the Board of Religious Technology Center and ecclesiastical leader of the Scientology religion, officially opened the doors of the new Church of Scientology of San Francisco. Addressing 2,500 Scientologists and guests, Mr. Miscavige dedicated the restored landmark Transamerica Building, in the heart of downtown San Francisco, to a new era of spiritual activity. “Here is the Central Organization from which to bring all our programs, all our technology, literally everywhere. And by that I mean you can bring tutoring programs to help all generations and give every community the language skills they need to realize their dreams in this land of opportunity. “You can spark the new groups that bring L. Ron Hubbard’s technology to those working with the unemployed and the homeless, to give them not only a new chance but a new life. “Across every community you can form the Narconon Chapters to end addiction. “In every halfway house and juvenile hall you can establish Criminon programs to restore self-respect and return society contributing citizens. “In every neighborhood you can form The Way to Happiness associations to bring common-sense morals right to the streets and Volunteer Minister chapters to tend to every other of life’s problems. “In other words, from here you can do it all. For this is more than just a home for you, the Scientologists of San Francisco.